If this option is checked, the wildcard settings defined for the individual TDB will be used for the TDB search. This is the default and recommended settings because the indexes used for the fuzzy search in TDBs are based upon the TDB settings. If you need to overrule the TDB settings for any reason, you can do this by activating this option and customizing the wildcard search according to your needs. This checkbox lets you enable or disable wildcard searching. You can choose between three different wildcard sets: "Both variable and fixed length: *, ? "; "Variable length only: *"; "Fixed length only: ?". The maximum wildcard string length determines the maximum string length that is assumed for wildcard (especially variable length). The higher this value is set the more is the search time increased. If this option is set, each word of a new TDB entry is automatically prepared for wildcard search even without adding any wildcards. Through this option the chance for TDB matches is increased if a match would otherwise fail due to a different case or a work or similar small grammatical differences. This sets the maximum wildcard shortening at word start. In the most languages the default value "0" is appropriate because grammatical differences usually take place at the word end. This sets the maximum wildcard shortening at word end. The default value is "1", but if a language often has longer grammatical differences you can set an appropriate higher value. 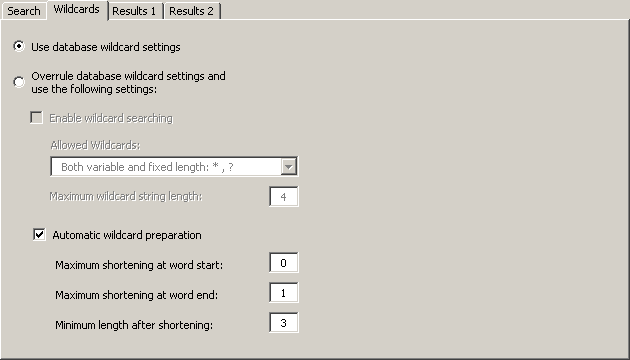 This sets the minimum length for shortening. In the most languages words have 3 or more letters.